Chia seed hit the US a few years ago and sales have grown sharply ever since. Originally grown in South America, this ‘supergrain’ has been around for thousands of years, but it has only recently regained popularity. So what makes it so special? Chia is full of omega 3, which can improve the health of your heart, and omega 6 which helps keeps your skin and hair healthy. The nutritional profile of chia is comprable to flaxseed, but as many of you may know it isn’t possible to import flaxseed into Japan, which makes the increasing availability of chia particularly good. Omega 3 and 6 are often low in a vegetarian and vegan diet so this is definitely something you should think about adding to your diet. 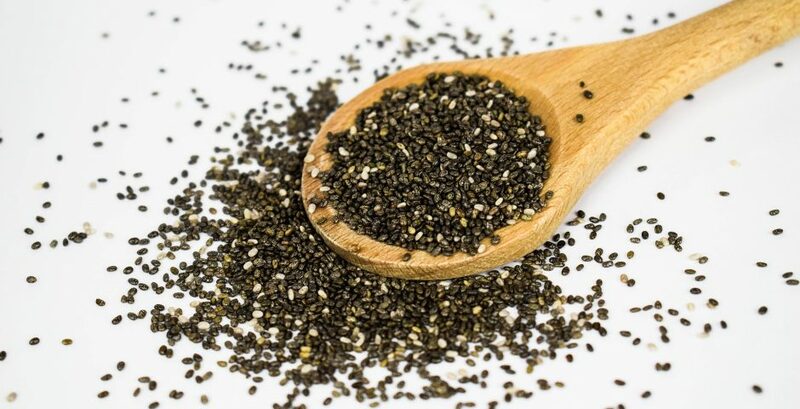 It’s not only the omega in chia that makes it special though; This seed is also high in protein, high in dietry fibre, high in vitamins and minerals (including calcium, potassium and magnesium) and high in anti oxidants. Again, from a vegetarian, and especially vegan perspecitive, it fills a lot of gaps in a typical plant based diet. Better yet, these little seeds can help control blood sugar levels by reducing the glycemic load of a meal. Type ‘chia’ in google and you will be hit by an avalanche of information on the wonders of this seed. How do I eat it? Flaxseeds, for all they are packed with nutrition, do have a distinctive, bitter flavour and due to the tough outer shell, usually have to be ground, sprouted or baked before they are eaten. Chia seeds are not like this making them much easier to add into your meals. The seeds can be eaten just as they are, sprinkled on your rice like furikake, sprinkled in a salad, or just eaten off a spoon. They are pleasantly crunchy with a mild, neutral flavour. What’s much more fun though is to add them to a glass of room-temperature water. Within about 5-10 minutes they will start to jellify, creating something like mini tapicoa. This means that they can also be used as an egg replacer to help bind cakes and biscuits, whilst also upping the nutritional content. What’s the recommended daily amount? As yet there is no official recommendation but to date no negative effects have been found from taking chia. One to two tablespoons of seeds a day would be a good place to start. Tengu Natural Foods is currently selling Organic Chia from the US company Navitas (227g for ￥1780) but we will soon be changing to a different US supplier. Due to the enormous popularity of the seed, supply from a single company could be a little sporadic so we may switch our supplier from time to time. We will however do our best to bring you the best organic chia at a similar size and price. アップルサイダーって何? What is Apple Cider Vinegar?